William Francis McBeth (March 9,1933 - January 6, 2012) was a prolific American composer, whose wind band works are highly respected. The popularity of his works in the United States during the last half of the twentieth century led to many invitations and appearances as a guest conductor, where he often conducted the premiere performances of his compositions, the majority of which were commissioned. His conducting activities took him to forty-eight states, three Canadian provinces, Japan, and Australia. From 1957 until his retirement in 1996, McBeth taught at Ouachita Baptist University in Arkadelphia, Arkansas. 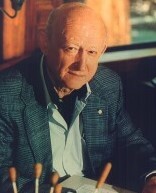 In 1975 McBeth was appointed Composer Laureate of the State of Arkansas by the Governor, the first Composer Laureate named in the United States. Other outstanding awards bestowed upon McBeth were, the Howard Hanson Prize at the Eastman School of Music for his Third Symphony in 1963, multiple ASCAP Special Award, the American School Band Directors Association's Edwin Franko Goldman Award in 1983, the John Philip Sousa Foundations Sudler Medal of Honor in 1999, and Past President of the American Bandmasters Association, to name a few.